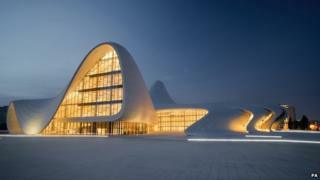 Artist Dame Zaha Hadid's Heydar Aliyev Centre in Baku, Azerbaijan, has won the Design Museum Design of the Year Award. Iraqi-British Hadid is the first woman to win the top prize in the competition, now in its seventh year. The Heydar Aliyev Centre features Hadid's signature elaborate curves and undulations. Previous winners include the London 2012 Olympic Torch, the Plumen light bulb, and the British government's Gov.uk website. The overall winner was chosen by a panel of experts from more than 70 nominated designs in the categories of architecture, digital, fashion, furniture, graphics, product and transport. The judges also chose winners in the other six categories. Winners included Prada for the fashion award and Volkswagen for transport. The winner of the first social vote category, which gives design lovers from all over the world the chance to vote for their favourite nominated design, was the modular smartphone concept Phonebloks by Dave Hakkens. Hadid's Heydar Aliyev Centre is the first architectural design to win the award. Chair of the jury Ekow Eshun, a writer, journalist and broadcaster, said: "It's beautiful, it's inspiring, it's the clear vision of a singular genius and we thought it was a remarkable piece of work." Hadid said: "We're absolutely delighted to receive the Design of the Year Award. "The surface of the Heydar Aliyev Centre's external plaza rises and folds to define a sequence of public event spaces within; welcoming, embracing and directing visitors throughout the building. "It's an architectural landscape where concepts of seamless spatial flow are made real - creating a whole new kind of civic space for the city." The Baku building is named after Heydar Aliyev, the leader of Soviet-era Azerbaijan from 1969 to 1982 and president of Azerbaijan from October 1993 to October 2003. The centre houses a conference hall, a gallery hall and a museum and was devised to help the redevelopment of Baku. Hadid's other recent notable work includes designing a main station for Saudi Arabia's ambitious underground system in Riyadh and she has also created the design for Tokyo's 2020 Olympic Park. She is a previous winner of the Sterling Prize for Architecture in both 2010 and 2011. In 2004, she became the first woman to win the Pritzker Architecture Prize. She designed the first of London's Serpentine Gallery's annual Pavilions in 2000, and many other noteworthy buildings around the world. In addition, she has well-known interior designs to her name, including the Aquatics Centre for London's 2012 Olympic Park. All the nominated designs for the Design of the Year Award are on display in an exhibition at London's Design Museum until 25 August 2014.